From within Elements, open the image by pressing Ctrl+O (Command+O on the Mac) and selecting it in the Open dialog box. If you want to select several images in a row, click the first image, hold down the Shift key, and then click the last image. If you want to select several nonadjacent images, Ctrl-click (Command-click) each image. As an alternative, if you imported images from a media card to your hard drive via the Organizer and have Camera Raw images in the Organizer window, select an image and open it in the Photo Editor or press Ctrl+I (Command+I) to open the Camera Raw file in the Camera Raw converter. Click Open in the Open dialog box. 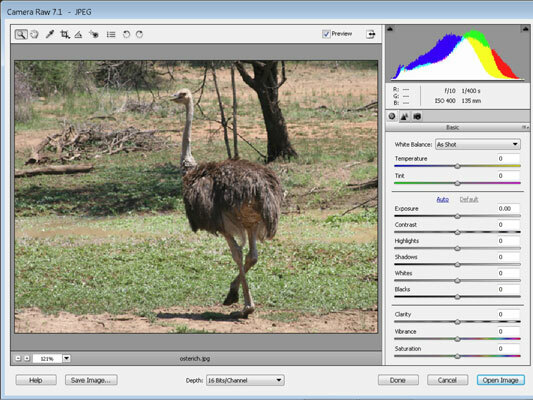 If you’re selecting multiple images, the images appear on the left side of the Camera Raw converter. You see a filmstrip-type display when opening multiple files. Here, a single image is opened in the Camera Raw converter. As shown, you can use a vast number of options to post-process your image before you drop it into Elements. This window is like a digital darkroom, where you can process the film and see what you’re doing to the image before you accept the changes. Choose from the options to post-process your images. If you have your monitor properly calibrated, all the adjustments you make for Camera Raw format are dynamically updated in the Image preview. Don’t be shy. Poke around and adjust settings to see the results in the Preview area. The more you play with the settings, the more you find out about how to get the best out of Camera Raw. When working in the Camera Raw converter, the adjustments are placed in the order you should follow. Start at the top of the right panel and make adjustments beginning with Temperature and Tint. Follow downward making adjustments to Exposure, Contrast, Highlights, and so on. You can go back and fine-tune the adjustments after addressing each item from top to bottom.